If you have a G1 Android phone, you can try out two games that I developed. They are available for free at the Android Market. 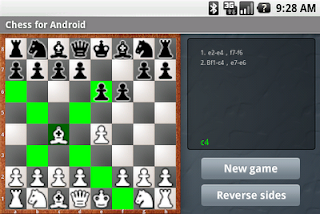 Chess for Android is a simple standalone chess application, consisting of a chess engine (derived from BikJump) together with a GUI (thanks to Joseph Wain for designing the chess graphics). The application accepts moves through the keyboard or touch screen. Once a source square has been determined, all valid destination squares are shown in green. The engine plays at various levels (including random or against itself). Reversi for Android supports keyboard and touchscreen input, and displays all valid moves through labeled "ghost" stones. This engine also plays at various levels (including random). My attempts to get consensus on standardizing an option to define the number of processors for an UCI engine on talkchess failed miserably, so I simply picked "Processors". The output of the prototype Deep BikJump on the "uci" command is shown below. The 32-bit version of BikJump v2.01 (after a minor bug fix) received a first rating of 2103 RUEL. Since this was tested on a Pentium IV processor (not good for bitscans), I am looking forward to get results back for the 64-bit version running on a Core 2 Duo or Quad platform. In the meanwhile, I have started work on Deep BikJump, featuring multi-threading to perform the search in parallel (commonly referred to as SMP support). Upcoming versions will be designated with the suffix P (e.g. v2.1P) to denote this new parallel support. Because I want to continue support for all major platform (Windows, Linux, and MacOS), I am working on a small threading toolkit that provides the right abstraction for keeping the major part of the chess engine unaware of details on Windows threads and pthreads. Besides switching to a home-brewed bitboard representation, other parts of BikJump underwent refactoring as well. Some modifications turned out to modify strength negatively. I already wrote about null moves below. Furthermore, because the new bitboard move generator generates legal captures much faster than all legal moves, the quiescence search originally had been modified to look at captures only. After including checks again in the first few nodes, some bad tactical errors were avoided. Similarly, late move reduction had become too optimistic, and needed some adjustment towards the scheme used by the older BikJump. While I am struggling to translate all "improvements" of BikJump v2.0 into actual stronger play, BikJump v1.8 became third in group A of the 5th Division WBEC Ridderkerk edition 16 and qualified for the final.